A number of years ago when I debated Anthony Rogers of Answering Islam, a statement I had made during that debate had angered some Christians. I had mentioned that some Christians worshiped the Holy Prepuce, which historically is accurate but was very upsetting to a number of missionaries. What followed was a video by Anthony Rogers, in which he had taken a brother’s personal translation of a narration that was incorrect and unique to his website that was framed in a polemical manner. Using the brother’s mistranslation, the missionaries produced a video that was supposed to be a response to my allegations in the debate. After I had seen their video, I announced that in a few days’ time I would publish a video response. Several days passed and the deadline passed, so I pushed the date back by a few days, again that new deadline was missed and another deadline was declared. The missionaries, seeing that the deadline was constantly being changed assumed that I couldn’t respond to their video, that the arguments they had presented were strong and so I was trying to pretend I could respond to their video when I could not. I saw their comments about me, I saw them boasting and celebrating that they finally got one over on me, they had a victory against Islam! This however, was not the case. While editing my video response I was contacted by the brother whose mistranslation was used. He showed me how the missionaries had used his website and read word for word from his article. The brother decided that he was at fault and would like to assist in the response video. So, we both began to work on the video. This was a major breakthrough, not only was a response going to be made but I had evidence that the missionaries stole someone’s research, word for word! As we gathered more information to put in our video, the deadlines passed and the missionaries had assumed I was having difficulty in making a response. Rather, so much work was being put into the video, deadlines passed because of the amount of information and sources we kept finding reasons to include. If I could remember clearly, there were three brothers and two sisters who contributed to the video. We were going to correctly translate the Arabic sources the brother had used and subsequently mistranslated. So we had more than one person translate the material, ensure it was valid, authenticate citations, there was a buzz of activity and sure enough, the video was almost done. In the end, the video was released and to all of us involved in producing it, we can say that it was very successful in what we had set out to achieve. Not only had the missionaries been exposed as plagiarists, they had falsely claimed someone else’s research for themselves, falsely claimed to have access to sources they didn’t have, falsely claimed to be able to translate fusha arabic, etc. The video was successful, so successful that the missionaries appeared on ABN TV and swore to release a second video in response to ours. It’s been three years now and they have yet to release any video. It would seem like deja-vu all over again in regard to my paper about Jay Smith’s mistakes. When I began the paper, I didn’t have the intention to publish something that would be very detailed. However, as my paper began to spread, there were requests to expand on what I had written and suddenly the paper went from responding to a few of Jay’s erratic statements to fully critiquing his opening statement in a minute by minute breakdown. I learned from my mistake the previous time, in this instance I have not yet set a date for when the paper would be published. The draft was made public for a few reasons. Most importantly, it was made public soon after the debate because I wanted to show the missionaries that we knew Jay had lied and lied badly. Jay had my questions sent to him on a number of occasions in which he refused to answer them. Even in a sit down with some persons who had attended the debate and noted his errors, he refused to explain himself. The funny thing is, Christians were elated, they thought that Jay Smith had academic arguments and sources, until my draft paper was released. 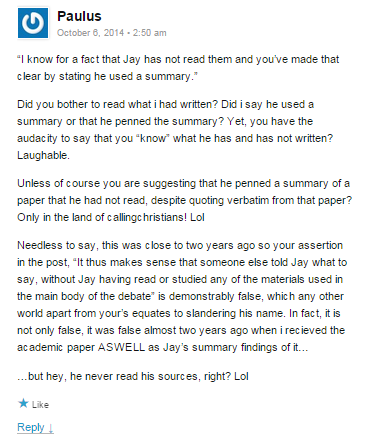 Showing the glaring contradictions between Jay’s claims and the works of the author’s he had mentioned, definitely burst their bubble. The fall out of having published the draft paper was that the missionaries went on the attack against me. We have to remember that Jay claimed to have read these academic publications, that he had access to his friend’s private thesis which was not yet published, therefore how could I, a nobody in the Caribbean have access to his friend’s works? How could I have access to Dr. Deroche’s or Dr. Tayyar’s publications? So, the allegations began to flow in that I was pretending to have possession of those works. That’s until I included quotes from Dr. Deroche’s works, even from his 2009 French work – we had it translated. What was worse is that his gang of friends accused me of lying about Dan Brubaker’s thesis, that’s until I published the cover page of his thesis with his supervisors’ approval signatures! Then came the allegation that Jay did read the works of the authors’ names he had mentioned and that I was lying. So, I turned the tables, I said I’ll gladly admit that I am wrong if anyone could prove that Jay did have access to and did read those works accurately. Which clearly states that the Topkapi Manuscripts date to the second half of the first century, which would be from 600 CE to 699 CE, or within the 1st year after hijrah, which is clearly not the 8th century as Jay had claimed. 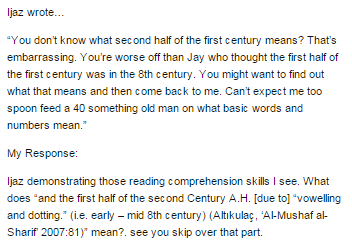 So if Jay did read the Turkish scholar’s work, then he either lied by omission or, if I were to give him the benefit of the doubt, he hadn’t read the work at all and had someone inform him that the scholar dated the manuscript to the second century/ 8th century, which is clearly inaccurate and misrepresents what the scholar stated. Unfortunately, both Robert and Paulus have yet to respond. The end result of all of this drama, is that I do possess the works I have publicly claimed to have, for those who viewed the draft paper before I made it private, I utilized several quotes and citations from those works. 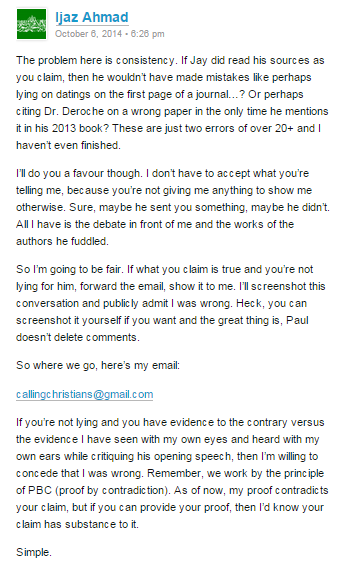 What is clear is that the missionaries are confused that I had access to those works and more importantly, that I knew their contents better than Jay Smith and by producing a paper with his intentional lies and deceits, I was denigrating the character of Jay Smith which as a result, casts a damning light on the state of Christian Apologetics. While I can’t give a certain date on when the paper would be fully published or when the accompanying video would be released, I can confirm that the only hindrance to its release has been by worsening health which prevents me from working on the paper on a consistent basis. However, I have a few translators preparing some select quotes from the works of a number of the authorities that Jay appealed to, which would surely embarrass him more and expose him for the charlatan that he is. What I can say, is that the paper should be released early next week or possibly this coming weekend, with the video a week after that – God Willing. Christian Apolegetics is ridiculous. Yes we were tyrannical but it wasn’t through faith it was through a culture that didn’t practice the faith in its light. That would be like Islamists apologizing to Christians and Jews for the terror from the so-called Muslims…I wouldn’t expect that and don’t expect that as a Christian. The solidified message of Islam is that the extemists that are killing innocence and personifying Allah as Vengeful and retributive as opposed to merciful and forgiving, do not know the faith. So don’t ask a Christian to apologize for people claiming to understand Christianity persecuting Islam, just as you ask us not to persecute you for the inequity of man who lust for blood and material wealth in this world and not the next. If we are believers and we are people who actually have faith, than why are we bickering and apologizing. Don’t ask me to apologize for the crusades, don’t ask me to apologize for slavery, don’t ask me to apologize for man’s inequity when I am standing up for what is right. God shows no mercy to the righteous man who has fallen, but all is forgiven to the fallen man who finds the rightful path. This argument reminds me of crazy ex-girlfriends who use thinks from months or yrs before to justify their actions when you have moved on and changed your ways. Are His ways unfair, or is really that our ways are unfair? Study Ezekial. I hope you are still willing to conceded you were wrong and issue an apology for calling me dishonest? How is it a “so-called paper”, as far as I am aware, it is a paper. Since however, you doubt its veracity, the “so-called paper”, along with the “so-called quote” does not relieve you of your responsibility to justify your claim. Insofar as it is still concerned, you are still dishonest as you have claimed you received a summary and a file from Jay, whereas this is not the information I have confirmed. If you are still willing to prove what you have claimed, then forward the email. Until then, your information directly contradicts what I found out. You have shot yourself in the foot Ijaz. You disputed that Jay had the paper. I told you he did because I received a copy of it. You know admit that Jay did have the paper. I need not forward you personal emails to justify myself. Again, you seem quite confused Paulus. As I have stated. What you claim and the information I have verified are two different things. What I understand Jay to have possessed is different than what you claimed to have received from him. It seems like you’re unwilling to provide proof of your claims and you want to force me to accept your version of events. I prefer to go by what a more reliable source has told me. They have proven their end. You have not. There’s no error on my part, there is however on your own. How so? I said that I received, a) the paper under discussion, and b) a summary statement of the said paper. You now admit that Jay did have access to (a) as of 2012 which accords with the timeline I gave you. (b) qualifies that the paper was read by Jay. As I said, I have no need to forward you personal emails since you effectively admit the very thing you first argued against. You have to admit that you were wrong and Jay did have access to the materials. Thanks for your comment. You asked, “how so”, given the agreement with the source I used to obtain the information I did, all I am at liberty to say is that the information differed. In regard to (a) I cannot confirm as to whether what you received and what he possessed were the same. The source I used concluded he had an incomplete digital copy. In regard to (b) this is speculation on your part and no evidence of this was provided by the source in question. As I have stated, since there is a difference in what you claim and what the better source claims, you are effectively still in doubt. To clarify any doubt, or to prove that you have not lied, forward the email. Your hesitancy to do so, only furthers the point that you have something to hide. As I have previously said and will say again, if you forward the email and I can confirm with my source, then I will gladly admit I was wrong. Since you refuse to provide your evidence and are depending on mere speculation, I cannot confirm your lies. Please try again. Thanks. I tell you what, why not look at my site here, dated 9 Oct 2013 and see how I quote the source that was forwarded to me. The one you said Jay didn’t have and continue to dispute was sent to me. How could I cite it, if I didn’t have it? Also, why did you remove your rebuttal from the comments? Is it because you knew I had this material over a year ago which would refute your lies propagated on this site against me? I don’t know what you’re citing or what your source of information is, given that what I was told disputes your story and claims. IF YOU HAVE IT THEN SEND IT. Anything short of sending it is excuses. If you are unwilling to provide proof of it, then that demonstrates that you are simply lying. Try to be truthful, don’t lie, if you had the proof you’d share it. Quite simple. I don’t know what you’re talking about, NOTHING has been removed from these comments. It’s funny that now that you don’t want to provide proof, you’re trying every excuse you can. Be a man for once, if you have the email forward it, if not, then you’re giving me excuses and that’s evidential of nothing.